Here we go again. This time it was at a high school in Florida. It has become depressingly familiar. Not just the horrific shooting, but also the words that come after something like this. Officials assure us that the victims and their families are in their thoughts and prayers. Then come the calls for more restrictions on guns. Then we get the reminders that if we see something we need to say something. It's all so predictable. But by now we know something else that's predictable: It's going to happen again -- if not at a school, then at a concert or a nightclub or a restaurant or an airport or even at a church. 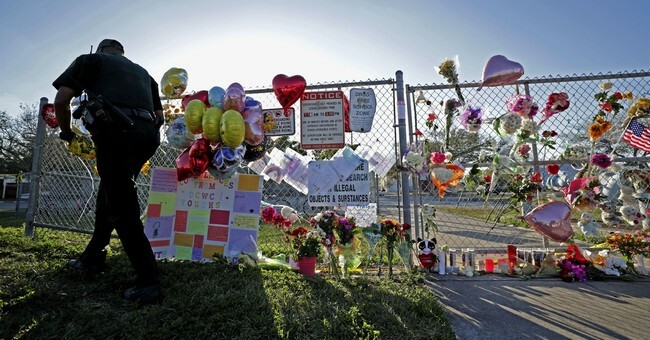 Nikolas Cruz had been expelled from school for getting into a fight with another student. Kids who knew him said if anyone were ever going to shoot the place up, he would be the kid who did just that. And last September a comment left on social media said, "I'm going to be a professional school shooter." The name underneath the message: Nikolas Cruz. A bail bondsman from Mississippi saw the comment and called the FBI. Five months later, just one day after the shooting, an FBI agent said, "No other information was included in the comment which would indicate a particular time, location, or the true identity of the person who posted the comment." The FBI said it reviewed databases and made other checks, but was, according to the agency, unable to identify the person who posted the comment. It gets worse. A day after that announcement, the FBI admitted that on Jan. 5, a tipster who knew Cruz called the FBI and provided information about Cruz's guns, his desire to kill people, his erratic behavior and his disturbing social media posts. The FBI says the caller was concerned that Cruz might attack a school. The tip should have been investigated, according to the FBI. It was not. So much for "If you see something, say something." And so much for what some have called the "Best law enforcement agency in the world." But even if the FBI had shown more competence and had found Cruz, what could its agents have done? They can't lock somebody up for posting disturbing remarks -- certainly not if he told them he was only kidding. Even people who eventually go on a killing spree have free speech rights. And he bought his gun, a semi-automatic AR-15, legally. Sure he was mentally deranged -- nobody in his right mind does what he did -- but being a loner and a troublemaker who loves guns isn't a legal barrier to buying one. And while everyone agrees mentally ill people shouldn't be allowed to buy guns, how do we determine that someone is mentally ill until he does something that really proves it? Do we want laws compelling mental health professionals to report the names to a national data bank of anyone they're seeing for anger issues? For anyone who might go off the rails? Do we want laws that allow police and federal agents to lock people up if they give signs of mental illness -- but have not been violent? Do we want laws that prohibit the posting of gun pictures on social media -- or laws that ban vaguely threatening speech? The same people who want more restrictions on guns would never sit still for more restrictions on speech or fewer restrictions on privacy. So maybe the laws need to change. Maybe people like Nikolas Cruz should have been held a long time ago and forced to undergo a psychiatric exam. In retrospect, that might have done some good. But it's an idea loaded with the possibility of abuse. There's already the predictable talk about banning AR-15s, the so-called assault rifles. They're not needed to protect families from intruders, the argument goes; hunters don't need them. Maybe something will happen this time, but it's not likely. We can beef up security at our schools and that might help. But last November, 26 people were gunned down in Sutherlands Springs, Texas -- at the First Baptist Church. Do we need armed guards at prayer services all over America, too? The problem -- and "problem" is not the right word -- is that we live in a free country. And in a free country we can lock up criminals after they commit crimes -- not before. So let's tighten security at every school in the country; let's have the same familiar conversation about guns; let's all agree that mentally ill people should not be allowed to buy guns. Let's try to put an end to this American tragedy. And then let's acknowledge that not much is going to change despite the fact that 17 more people are dead. We can tell the victims that they're in our thoughts and prayers, and after a while we'll resume our normal daily lives -- until it happens again. And we all know it will.